Last January I quit my job . . . this is the story of how I was given the courage to do it. My small church graciously held open my position as associate pastor for six months after the twins were born. As the time ticked by and the heavy heat of summer turned into fall, then winter, my mind and heart danced anxiously around the decision of whether or not I would return to work. There were the usual pressures, finances and a fear of losing ground professionally, as well as the fear of losing myself in the incredible task of caring for four young children if I didn’t return to work. In my heart, though, I knew I simply couldn’t do it. At five months out my body was still worn-out from the incredible pregnancy, the birth and the long-haul endurance race of breastfeeding twins. The answer was simple, clear even, and I knew I couldn’t go back to work, couldn’t spin one more plate even if I wanted to. It was a simple question, probably more for the sake of conversation than real inquiry, but I felt its pull like gravity. In that moment I felt my need to be needed, my love of work, my desire to be important, all of those rose to meet the question and I paused as any addict might when confronted with a whiff, a glimpse of that which he or she has decided to renounce. Then a vision came, brief and vibrantly clear, like a flash in my mind. I saw a donkey standing in a field beside a heavy yoke that lay in the grass. At the same time, while seeing the yoke and feeling the familiar pull of my old job, I also saw the sunlit field, which lay like a colorful quilt spread beneath a bright blue sky. The field was filled with flowers, a joyful, chaotic display of beauty that stood like an invitation all around. The clarity of the invitation - to set aside my "work" and simply explore that field in all it's beauty - helped me find the freedom to choose. There would be no condemnation if I chose to return to work, the donkey after all is a beast of burden, gifted at getting the job done. But suddenly I could see more than the work that needed to be done. I could see the field as more than a means to an end, more than just furrow after furrow of earth to turn for productivity’s sake. I saw the beauty and possibility; I saw it could be a place for resting, a place for savoring and enjoying, a place worth exploring rather than cultivating, if only for a season. “Yes,” I said, “I’m sure,” though the tears still threatened to rise. I've cried many times since making that decision, felt waves of grief rise up on Sunday mornings as I miss the pulpit and its power, as I miss the role and the joy of getting behind the plow with a team and getting things done. Yet I realize now that the work will always be there, but these precious beautiful flowers, oh my, they fade so quickly, I can hardly take them in and I don’t think I could live with myself if I missed even just one. I made my choice and wherever you see a field of wild flowers, that’s where I’ll be, just wandering, waiting, breathing them in and, oh my, if this is your season to work, may God bless you in it, but do stop by from time to time and I’ll show you what I’ve found, what God keeps showing me out in this field of beauty and wonder. Want to read more about the transition to being a mother of four? You might enjoy, The Blessing or Impossible. 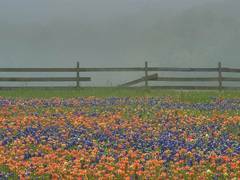 Follow this blog on facebook at A Field of Wild Flowers or on twitter @inthefieldswGod. Every day after their naps I carry my one year old twins down the stairs, one on each hip, like a hulking maternal weight-lifter. Pausing in the kitchen, I lean them over the counter one at a time to grab their matching sippy cups and then hurry toward the living room hoping to make it there before my arms give-out. Still holding them as they grip on to my shirt and cling to their precious juice, we all slide slowly to the floor where I sit cross-legged in front of the couch, one boy on each leg. Here they alternate between snuggling and gulping, occasionally working out a tenuous trade of cups, a treaty composed entirely of gestures and grunts. There’s an invisible, but mutually agreed-upon line of separation that runs down the middle of me - if one crosses into the other one's territory all hell breaks loose. This causes me to marvel at their possessiveness, their indignation at having to share me as though they’re not both being held. Later, at the end of a long day, just before my husband gets home or after dinner when the dishes are done and the floor swept, I make my way out into the living room. Once there, I lay down and stretch out on my back on the floor. I hardly hit the dusty, old carpet before the twins come running and pile on me like puppies, slobbery and sweet with their toothy, wet smiles. Their top-heavy little bodies tip and flip and roll on and off and around me and my only care is to make sure no one gets hurt. Sometimes, through great effort, Isaiah rights himself and circles out and away from me. He toddles along on stocky legs and padded baby feet, grinning his gap-toothed smile as he looks back over his shoulder, then turns, running, and dives back into me. When I’m on the floor, I’m theirs - my body is theirs, my time is theirs and they claim their right to me fully. I come and lay down among them because I know they will be drawn to me and my desire is to be with them. It occurs to me in this season of Advent that I can think of no better image for the Incarnation. In my stooping and bowing, my sliding down and laying out I am mirroring God to these boys; God who comes to dwell among us, laying down, stretching out in the middle of our dusty, dirty world, hoping we will be drawn to him. God who holds us, who delights in us and marvels over our petty arguments, our human desire to part and parcel him out as though we are not all being held. 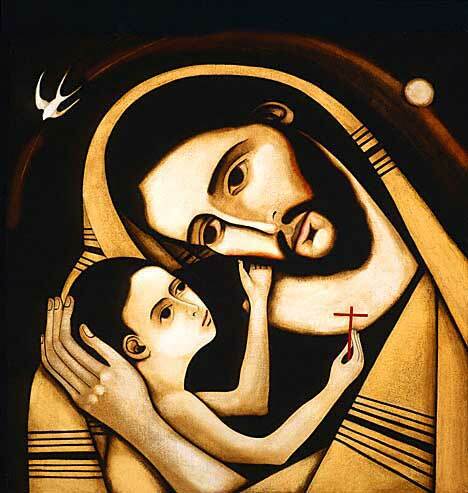 This year I've found myself drawn to the character of Joseph in the stories of the nativity. Mostly I find myself wondering about him - what kind of person was he to be able to surrender to a life so far beyond his control and desire? to allow the inklings and images of a strange dream to shape his future? As I wondered I started writing which led to this little bit of fiction. Enjoy! and May your Christmas be blessed! There was no way to get comfortable, just as there was no way to quiet his racing mind. Laying on the thin sleeping mat it felt as though his thoughts mirrored his body, restless, twisting, turning and seeking resolution. He rose a time or two, paced, knelt, and rose to pace again. He wandered out at one point into the dark night, the cool air, and paused to look up at the wide sky, the brightly hanging stars. Rather than feeling relief, though, he was overwhelmed by his own smallness so that the wideness of the sky left him feeling more lost and fearful than he had since he was a small boy. The enormity was disorienting, frightening and he quickly turned back inside and lay down with something like resolve. Most of what he knew about life he’d learned from working with wood and it was no surprise that his distracted mind, even now, kept returning to his workshop. He’d learned, over time, to read the wood and find there the answer to his questions, not in the way of the sooth-sayers, seers and magicians who lined the market square, but in the same way that every skilled craftsman knows that all things material speak also of the eternal if one is able, willing, to listen. So it was that his mind worked on the problem, the conversation, going over it again and again as though sanding, seeking beneath the surface some deeper meaning, some guiding revelation. He’d turned and walked out when she told him, the largeness of her revelation, of what she was asking, striking him like the wideness of the night sky so that he felt suddenly small and foolish, lost. His leaving was automatic, rising from the primal urge to flee in the face of pain. He was grateful now that he hadn’t struck out in anger or rage as he might have in his youth. Grateful that life had taught some level of restraint. He’d always been a dreamer, an idealist of sorts and in his youth the use of force and power were reflexive as a means to an end. Believing in the righteousness of his ends, his ideals, he’d been known as a hothead, a firebrand, a short fuse that was quick to light and long-burning. His religion, his righteousness, and the accompanying anger had given him a sense of identity, a sense of arrival and of having a place to stand in the world which, at the time, he took to mean that he was at long last a man. It was hard to say exactly what had changed him over the years other than the usual series of failings and fallings and losses. The wood too, had worked on him even as he worked on it. Wood doesn’t respond well to power and anger. It had enraged him at times working beside his own quiet father; the way he couldn’t make the wood do what he wanted it to, couldn’t make it bend to his willing, but instead had to surrender himself to its lead. It was the wood that caught him up short time and time again, caught him in his fire and force. It took years of projects that splintered and split apart at the last minute, of bent nails and wood that turned on him to accept that he was not in charge. When he worked in a shop of his own he would occasionally give in to frustration and rage, throwing a project with defiance. There was a humility required in the craft that stood at odds with everything he believed about the world and what it meant to be a man in it. But that was a long time ago and now he felt himself changed, smoothed, worn-down, as though he were the piece of wood and life was itself the skilled hand of the carpenter. Life had sized him up, stripped the bark and rough edges away until he found himself exposed and yielded like wood in skilled hands. Life had whittled away at him until what was left was something less, but purer and he’d fallen into a habit of waiting to see what use there might be for one so diminished. The arrangement, the engagement, had seemed too good to be true, unexpected, but fool that he was, it brought a spark of hope. The girl wasn’t pretty, but sturdy and young. To his eye she seemed like a tree, a rough exterior hiding something truer within; she had a depth and presence like all trees do and he found himself drawn to her. He’d approached the engagement like he approached most pursuits these days, slowly, watchfully, and maybe that was why her words shocked him so, stung him in a deep place. Now he lay wrestling unwilling to accept one more submission, one more surrender to a life larger and more painful than he’d bargained on. At some point he found himself dwelling in the thin space between sleeping and wakefulness and this was when the dream came. In the dream he was working in his shop, fitfully sorting through piles of discarded wood, looking for something he couldn’t name. There were layers of dust and wood shavings everywhere that rose up like small clouds and flew like sparks as he frantically lifted and moved the lumber. Then he found himself in a shaded wood. Sunlight glinted down through the uppermost branches of tall trees, but the ground where he stood was dark and cold. Here too he was hunting, searching for something. His axe hung from his calloused right hand as he plowed through the woods that seemed to go on forever. He felt a deepening anxiety as he pressed forward, stumbling over the roots of ancient trees; the feeling that he was forgetting something important mingled with the feeling that some dark shadow was following him. He was running, crashing through the woods given over almost completely to panic when he saw a glimmer of light in the distance. The light calmed him enough that he stilled, turned and, as it happens in dreams, found himself standing inexplicably in a brightly lit clearing. A stream ran through it, chattering along happily and beside it stood a young tree, its leaves green and shimmering. Something about the tree and the happy brook and the way it contrasted with his fear and anxiety sparked a deep rage inside of him. Feeling the axe in his hand he turned and wielded it with all the strength of his youth. He fell the tree in a few quick fierce blows and let the head of the axe fall to the ground, leaning over it drawing in deep shaking breaths. Then, looking up, he saw a small shoot growing up out of the stump as if in defiance to his destruction. It grew and sprouted branches, leaves, before his very eyes. It was as though the tree he’d cut down contained within it the seed, the root of an even greater tree. This, too, sparked rage in him and he leaned back, straightening, and lifted his ax into the air bent on destroying the stump and the shoot with it. It was then that he felt the hand, hot and heavy like fire on the back of his arm, then that he felt the Presence of one standing, hovering behind him. The touch stopped him, mid-swing and the fullness of time fell open around him. It was as though the angel’s touch released a damn of sorrow and fear that had been building and the intensity of it all bent his knees and brought him broken, weeping to the ground. Those words washed over him like a wave so that his fears were lifted and following, like a second wave, he heard his own name, ”Joseph, son of David.” At the sound of his name, he felt himself returned, no longer wandering or lost, but solid, present like one who’s returned home after a long and harrowing journey. As he knelt, rooted beside the stream, he felt the angel lift his chin, the touch now cool and refreshing, like water from a spring. His chin was lifted and his eyes looked to where the tree had been and there he now saw the girl, Mary. She looked straight at him and in that gaze he felt himself being aligned with her, felt the love rising in his gut, felt for once that he knew where he was, who he was and that everything from then onward would arise out of that knowing. In her eyes also he saw the light of the child that would come, like a glimmer of light without shadow, a small spark that would grow. As he looked, the angel whispered in his ear one last word, “Jesus.” And at the sound of the name, the spark leaped in Mary’s eyes and Joseph’s heart leapt within him. In the morning it would seem that after the dream he’d fallen into a deep, heavy sleep,. It was the kind of restful, peaceful sleep he would never experience again. For though the dream located him, changing forever the map of his life, the days and years ahead were still filled with restless, shifting nights. Nights of worry,and foreboding, nights of fleeing and the hovering fear that he would prove at long last to be nothing more than a fool. In this way his life was sanded down, bent in ways beyond his choosing and he learned to stop wondering what it would become and lean into what was. During those restless nights the dream was a star that guided him and he clung to it fiercely, that and the shepherds' visit, the star that hung low and heavy over the birthing place, and the visit of three dark strangers who mumbled in a foreign tongue, fussing over the child. All of these became points of light in the darkness so that now when he lay restless, wrestling on his mat and rose, stepping out into the wide, dark expanse of the night, he felt not small and fearful, but rooted, as one following a scattered trail of stars toward home. guiding us into the heart of things. I feel caught this week between real grief and desired joy as I tend my little flock and run and rush between holiday concerts and parties. I've fought the urge to tear-up while waiting in line to drop my six-year-old off at her elementary school, noticing the newly stationed policeman watching over her small, bobbing frame as she disappears through those wide doors. And I've felt a guilty pleasure every time I get to bring her back home with me at the end of the day. I've sat through too brief moments of silence unable to wrap my mind around a single word or a prayer that might suffice, which are followed by halting renditions of Jingle-Bells and tiny voices squeaking out memorized lines of "good news of great joy for all people." Tonight as I stood in the kitchen finally mixing up the long-awaited Christmas cookies it occurred to me that this is the longest night of the year - the winter solstice. Here we are just a few short days before Christmas experiencing the longest night and to top it all off it's windy and cold here and I'm walking around tossing in ingredients and stirring up cookies with a blanket wrapped around me like a toga. There's much to be missed if we move too quickly out of this darkness. This was during the first of nine mini-retreats I would be attending for a program on contemplative silence. I was disappointed to see that my fellow participants were older than me by a good twenty to thirty years. As a young mother I felt woefully out of place, painfully aware of my fear that I didn’t fit in, and afraid of the hunch that this was the wrong time in my life to embrace contemplative spirituality—to pursue a call to prayer and silence that stood in such stark contrast to the daily realities of my life. It was with relief that I noticed the statue of Mary. There she stood, a young woman holding her young child smack-dab in the middle of that holy space and my eyes were suddenly opened to seeing Mary as a mother like me, Mary as a woman who pondered, who prayed in the midst of an everyday, ordinary life. Continue reading this post here at shelovesmagazine.com. I stand over the small wooden table gazing at the meal, my eyes taking in its beautiful simplicity. The host ladles me a generous scoop of steaming, creamy soup and I shuffle slowly around the table in silence with my fellow retreat participants. I fill my plate with a simple fresh salad, top it with nuts, and move on toward the bread. Reaching my hand out to pick up a slice I notice that each piece is generously buttered. It's enough to make me want to weep. 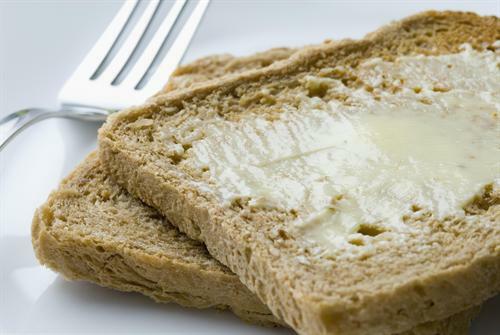 To me, that butter is love and I see immediately how buttering bread can be an act of love - generous, simple and true. With the sweep of a knife and the smooth gliding-on of glistening yellow goodness that bread became a sacrament, a means of grace, that butter yet another expression of the love of God in the world. In his essay, Dubus, a devout Catholic, describes the laborious process of making sandwiches for his young daughters to carry with them to school. As he maneuvers his large, bulky wheelchair around his cramped kitchen, as he reaches for the utensils, as he tries to open cabinet doors from his awkward position, and as he cuts the sandwiches, he realizes what he is doing for his children. this trimming of liverwurst, of ham. All sacraments . . . There are so many days when I feel it to be true – the fact that I simply don’t have enough to do this job of mothering well. Not enough patience, not enough compassion and curiosity, not enough LOVE. I am so busy. I am so tired. I am running on empty. But still, I feed them, even if that feeding only consists in the tearing open of a bag full of salty, fatty carbohydrates; even if the meal was bought with money we didn’t have because for once I just wanted to sit down and relax together, gathered around these few moments of guilty pleasure. I chop, I peel, I dice and slice. I sauté, bake, simmer and spread every day, three times a day or more. I ladle, scoop, and dish it out. These rituals I perform day in and day out, like a liturgy of love, each stroke of the spoon a prayer, each flip of the spatula an amen. These days, when feel I don't have enough, I trust, I hope and pray that these simple acts of love, these sacraments coming as they always do in broken ways will be transformed as they’re consumed. Sunbutter and jelly sandwiches, gold fish and juice-filled sippy cups transfigured into love so that even on the days in which I have so little to give, they are being filled with good things. These children of mine, they are eating my prayers, being filled, bite after bite, with love. I was only a few weeks in to blogging when I stumbled across Shawn Smucker's blog via a friend's site. His was one of the first blogs I ever followed, probably the first I commented on, and I continue to look forward to his posts each day. 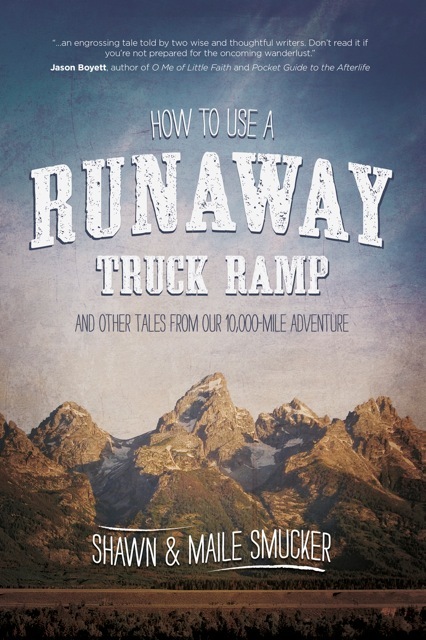 Shawn's newest book, How to Use a Runaway Truck Ramp, came out this week and is available in multiple formats on Amazon and at Shawn's website, shawnsmucker.com. The book follows Shawn and his family of six on a four month cross-country adventure. Having dreamed of traveling the country in an RV "someday" Shawn and his wife Maile move their plans up by a few decades as they find themselves faced with a failing business and a simultaneous call to move into writing as a full time career. Maile is also a writer and blogger and both contribute to the book that's both funny and reflective. Shawn and Maile capture the excitement and anxiety of adventure while continuously giving glimpses into the deeper workings of God and grace in their lives. I'm please to share an excerpt from the book below and encourage you to check it out on Amazon or click over to Shawn's blog to find more reading. This excerpt is a little more serious than much of the book, but is a prime example of the depth of insight with which Shawn and Maile explore life. One night I called my mom. Within a few seconds of hearing her voice on the other end of the line, I knew something was wrong. “Shawn, I have some not-so-good news,” she said in a quivery voice reserved for funerals and personal catastrophes. “Your aunt has cancer,” she said. It’s rather shocking, actually, to discover something like this. It felt like discovering there was a traitor in our midst. I found myself wondering which nearly invisible cells in my own body were planning a revolt. Which tree was going to fall on our bus. I started seeing death behind every oncoming car, or hiding in every shadow. Then a few weeks later I found out that some very close friends of ours were miscarrying their baby. I didn’t know the details. But the sadness was recognizable and reminded me of standing next to Maile at a routine doctor’s visit when she was pregnant with our third child. The doctor looked up at us with pursed lips and confused eyebrows. “I’m really sorry to tell you this,” she had said. “But something isn’t right.” A few weeks later, Maile miscarried. Friends hugged us. We walked around our house quiet and empty. There is something devastating about hope unattained. The unexpected diagnosis. The bright candle that turns into a smoldering wick. The “something isn’t right” speech. Sometimes, just sometimes, it makes me wonder if hope is worth it. Makes me want to live a life where I always expect the worst, keep my hands closed, my eyes on the ground in front of me. Too much looking out at horizons exposes one to the possibility of disappointment. Then on a Tuesday evening during our time in Nashville, I went outside to help Maile’s brother till his garden. He and I took turns pushing the rototiller around, pushing all the old dead grass and hay under the rich brown soil. Then I raked out the dead stuff to the edges and piled it all into the wheelbarrow. The soil went from looking barren and rather unwilling to expectant. Open. It takes a lot of turning over to reach that point. A lot of pounding and tearing and grinding of the soil. The rototiller grasped at the ground like giant claws. Our shovels bit into the ground and formed the edge of the garden. As I worked the soil and the sun dropped behind those Tennessee hills, I thought of my aunt with cancer. My friends losing their baby. They were being tilled. They were being churned up. But I know them, and I know their hearts. And while it will not diminish the pain they feel now, I marvel at what rich soil they will become. Shawn Smucker is the author of How to Use a Runaway Truck Ramp and Building a Life Out of Words. He lives in Lancaster County, PA with his wife Maile and their four children. You can find him on Twitter and Facebook, and he blogs (almost) daily at http://shawnsmucker.com/ Maile blogs at mailesmucker.blogspot.com. I wander around the house these days, treading water, trying to stay afloat while crunching layers of cheerios under my feet and endlessly ferrying dirty glass bowls from one room to another. Click here to cotinue reading this post titled: Impossible. What impossible thing are you facing today? May Mary's question and the angel's answer be a guide and a comfort to you. I met my friend in the wilderness the other night. Well, it wasn't exactly the wilderness, but it was a bar of sorts, which for me still qualifies as a real and somewhat alarming wilderness, being the good Christian girl I was raised to be. She was late and I sat there in the dim light trying to appear busy on my phone and constructing to-do lists on the white placemat in front of me. She arrived full of unnecessary apologizes which I quickly brushed aside and we dove in head first. Between us there's little need for small talk and right there in the middle of that noisy wilderness we each pulled open the layers of our lives and sat back, listening through tears as our hearts talked for awhile. This is the friend who tells me how her marriage really is, tenuous and struggling, and shares how she slapped her son in a moment of exasperated rage that has melted now into a messy pile of regret. She is the one I can tell how I yelled at my own son, threw a royal tantrum of rage that scared him and me and how we all ended up on the couch in tears trying to figure out how that day could be redeemed. I have to admit that I never really liked Maurice Sendak's book, Where the Wild Things Are. I tend to like books that are warm and pretty, books that affirm my need for a world that's safe, orderly, and predictable. But, it’s possible that the fact that I don’t particularly like the book is an indication that I do get it, a little bit at least. What I do understand is that Max is struggling with the wilderness, with all that is wild and untamed both inside and outside of himself. Something about the unrelenting, all-humbling job of parenting leaves me all too familiar with this wilderness. If my life were a children's book, then one might notice a forest of sorts growing in my house most days right around four pm or any other time that happens to be about an hour before my husband is due home and a half-hour before I lose it. Too often by that point the day is been played out - patience is gone. I'm wresting dinner onto the table while kids are whining, fighting, hanging and swinging off of my legs like the little wild things they are. By then we're all wearing our wolf suits and if the windows are open the whole neighborhood can hear the roaring, gnashing of teeth and rumpus that ensues. As a parent, as a human, I'm well acquainted with wilderness and wild things, within and without, but it doesn't mean I like it. It's significant that the gospel of Mark places the advent of the good news of Jesus Christ right smack in the middle of the wilderness. This gospel has no time for angels, places no stock in genealogies or other such small-talk as a means of introducing the striking, challenging figure of Christ who emerges in the pages that follows. Mark begins like my friend and I do, by peeling back the layers and starting not in the skies full of stars and angel choirs, but on the bare, dusty, rocky ground of the wilderness. Something about this gives me heart, gives me hope, as this first week of advent is designed to do. Something about it resonates with the prophecies of Christ and the prophets who spoke them, those craggy ill-kempt men and women who lived on the edges and thereby lived and spoke that much closer to the heart of things. The good news begins in the wilderness. What a challenge, what a hope. The friend I met with told me how she'd shared with her counselor that she has few real, close relationships, few relationships where anything beyond the bright cheery small-talk of this season might be appropriate. Her counselor said, "Yes, but what about this Kelly? It seems like you have a real relationship with her, why do you think that is?" My friend, God bless her, said, "Kelly's real. I mean, she told me she threw an apple peel at her children, for goodness sake, so I feel like I can be my real self with her." After telling this story she looked at me with tears in her eyes and said, "Why is it so hard to believe that our humanity is what's most attractive about us?" Oh, my friends. How deep and wild is the wilderness within you? Who do you have who's willing to meet you there? This is the beginning of the Good News of Jesus Christ - the One who came and dwelt among us, who meets us in the fullness of humanity. Christ, who "sailed off through night and day and in and out of weeks and almost over a year" to meet us here, "where the wild things are." I'm so grateful for my friend who gave me permission to share from our conversation - she's one of the flowers in this beautiful field. There was a time about eight months after the twins were born that I felt like I really needed (ie. wanted) a pair of rain boots. I scoured the internet for weeks on end, I watched e-bay like a hawk and finally I bought a beautiful pair of lime green boots - they're the happiest boots I've ever seen. When they arrived my children swarmed the door as they do any time the UPS man approaches. I grabbed the box, declared it MINE and quickly set it aside to open later. When I finally opened them I was greeted by their heavy rubbery smell and marveled at their beauty as my children stood by, their eyes glowing with excitement and anticipation. I looked the boots over and set them aside. My children gasped in astonishment, "You're not going to wear them!?" They immediately clamored around my precious new boots and began man-handling them in a wide variety of ways. In that moment something rose up in me and I blurted out, "No, these are MY boots. You MAY NOT touch them." My children looked heartbroken, confused, as I gathered those boots and hauled them off to my room where they stood in line like soldiers awaiting the call of duty, waiting until I was good and ready to enjoy them. 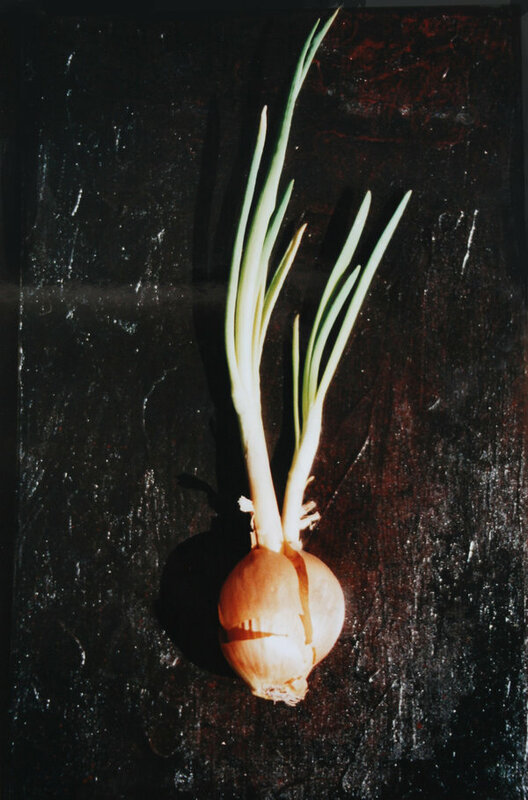 It's strange, I know, but I rather like Dostoevsky's onion story. I like the way it captures the impulse of human greed in such a recognizable way, how cleverly and simply it reveals the way that greed hurts not only the greedy, but all involved. I love this story in the same way I love the story of Jonah for it too is a story of greed and jealousy to the point of hatred and Jonah too is willing to die rather than let go of his righteous anger. These stories catch me and I glimpse myself in them as one does in walking by a mirror or store window; in a flash something is revealed in me that I know to be true but am not often willing to recognize. I value this story for the way it catches me unawares and raises questions about my possessiveness, the way I protect me and mine and the cost of the things I keep. No one could truly be as "wicked" as the woman was said to be, but that impulse is something we all know. I'm a giving person, as a mother of four one could argue that I give of myself all day every day and it's good and right that a few things should be saved for just me alone. I would say you're probably right on most accounts, but the next time my husband reaches over into my bowl of chips and I slap his hand away with a snappy, "Get your own bowl," maybe I'll remember this woman and her onion. When the words "It's mine, not yours," rise so easily, so reflexively, and in such contrast to the mercy and joy and grace of the moment, I want to notice them, to sit awhile and consider their source, to notice the cost they bring to bear on my own soul and the souls of those around me. Help me to remember, God, with grace, the cost of MINE. Help me to discern what to hold tightly lest I be held, imprisoned by that which I hold. I read this story last month in preparation for a retreat on Giving and Receiving. It stayed with me, captured me, and rolled me around in its images and irony, its extremes and it's still not finished with me yet. So here I am, sharing it with you. What do you think?